It seems many folks buy an air compressor without considering compressor sizing. Things to be considered include what they intend to use the air compressor for, or how big an air compressor they are going to need to provide adequate compressed air to run their air tools and compressed air using equipment? For compressor sizing it is necessary to figure out how much air you’re going to need. That is… the air requirement for all the air tools, all the blow guns, all the air cylinders, all the air operated diaphragm pumps, all the everything that is in your plant or workshop that uses (or has the potential to use) compressed air. Consider how much of that equipment will be operated at the same time, and whether or not that compressed air demand is going to be constant, or change as your tool use changes, production using air equipment increases, and so on. There is lots of additional information about compressor sizing on this page. As well, the comment form at the bottom of the page invites you to ask a question about compressor sizing, or make a suggestion to help others. When first venturing into the air compressor-sizing arena, folks tend to be more than a bit intimidated. There’s such a vast array of compressors, of types, of capacities, with a veritable feast of accessories; it’s easy to become confused! And, though there are many manufacturers of compressors world-wide, all are focused on selling their own products, which may impart a certain bias to the information that’s available from them about their compressor-sizing, you think? Consider What’s The Compressed Air For? Have you determined what you’ll be using compressed air for? In order to correctly size your compressor, you really must do some homework towards figuring out the volume of compressed air you will require. There is a page on this site about various uses for compressed air that you may not have seen as yet. It’s linked from the site map. Is Compressed Air Use Quantity A Total Or Periodic Demand? If it is necessary in your plans to run all of those compressed air using appliances at the same time, and for long periods of time, then you are going to require a much bigger compressor than if they are used intermittently and sporadically. If your compressor is for continuous air use then start making a list of everything in your plant that uses air, and leave a space beside each to note the expected CFM demand for each. Better yet, use a spreadsheet so that the air consumption numbers can be set up to give you a running total of the air you’ll need. Know that compressed air consumption of tools varies depending on the size of the air tool, it’s speed, and the efficiency of that air tool. You need to get the specific compressed air demand for that air tool from the manual or the manufacturer of the tool for accurate assessment of the overall compressed air demands of your shop. 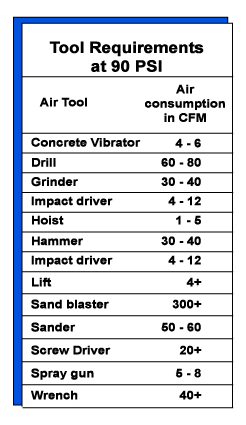 You may find the chart below handy in approximating the CFM requirements of an assortment of standard air tools. This is a general guide only. Your actual consumption of compressed air will vary, depending on your tool size and design. Air tool consumption changes based on variables. Grinders will have changes in consumption due to grinding wheel size, and rotary sanders will have their consumption change due to the pad size. Even the same tool from two manufacturers will have different air consumption rates. The chart above is just a rough guide, and may not accurately reflect the air consumption of the air tool planned to be used. The best source is to get the air consumption figures for a specific air tool from that tools booklet / manual, a label on the tool. Failing that, contact the manufacturer! They should be able to give the the exact consumption. If contacting the manufacturer, have the model number and serial number of the air tool at hand because they will normally ask for that. Consider “factoring in” the highest air consumption figures you find for the tools you expect to use. You may oversize your air compressor capacity by doing so, but under sizing the compressor you purchase may bring greater long term costs to your plant as you grapple with air tools or air cylinders that do not run as expected due to a lack of compressed air supply. Air tools are only one of many applications in a plant that consume air. It’s necessary to give consideration to all of the ways that you will consume air in your plant and applications. Some folks don’t consider an air-driven blow gun as an air tool, yet these can sometimes use more compressed air than expected. Air driven automated production machinery can consume far more air than some air tools as air operated production equipment with valves, air cylinders and other air actuators is often run for 2 or 3 shifts per day, with up-time measured in weeks. Each piece of equipment may have dozens of air actuators or air cylinders operating at high speed. How do you figure out air consumption of equipment? Air tool manufacturers typically have compressed air and pressure specifications in their manuals for each air using tool. The manufacturer of equipment should be able to provide the compressed air demand figures for their machine. They know how many cylinders or actuators they have including, they know the cycle rates of all air using equipment, and they likely have already figured out the total air consumption for their machine to ensure that you are providing enough air to make the machine run correctly. You just have to ask for it if that data is not included in the equipment information package they provided. If you build that equipment yourself though, how much air will the air cylinders or air actuators on the new piece of equipment use? When you are determining the size of compressor you need, the rule of thumb is that each HP (horsepower) of electric motor size is able to generate 3- 4 CFM of air flow at about 90 PSI, (PSI = pounds per square inch). This holds true for compressors over 10 HP in size. Smaller compressors may generate less flow per HP of motor size, particularly when you get down to fractional electric motors on small air compressors. Always make sure you ask the compressor vendor what the expected actual CFM is for a particular model of compressor. It seems that the promised compressed air delivery from air compressors is similar to the estimated mileage figures you get for a new car! They are sometimes only theoretical. You will also need to know at what pressure that promised air flow will be, as air delivery figures at lower air pressures can be higher than the delivery of compressed air from the same air compressor at higher pressures. I measure air flow from the air compressor in CFM.Others measure compressed air in SCFM, or even ACFM, which means actual cubic feet per minute. Be careful when you are getting the air flow specifications on compressors, as some manufacturers size their compressor discharge rates as if the unit was pumping free air. As air pressure in the tank or mains air is compressed, the compressor pump has to work harder. A compressor might show a CFM rating of 8 for example, but reading the fine print will tell you that it generates 8 CFM at a much lower pressure rating than the pressure you may require. Industrial systems (actuators / air tools) often require about 90 PSI to work to their capacity. Some will require higher pressure, and some lower of course,depending on the work each has to perform. Use an air regulator at the point of compressed air use to dial down the pressure and run the air equipment at the lowest possible effective pressure level. You may save substantial energy costs in so doing. Industrial plants have air compressors generating excess pressure and flow for the inevitable over-line air pressure drop. This helps to ensure that they have sufficient compressed air pressure and volume at their end application to keep their equipment running satisfactorily. The compressor you pick has to have this capability if it is an issue in your plant. Again, some manufacturing plants will maintain a 20-30 PSI “safety margin” in extra compressed air pressure from the receiver, to help ensure that none of the plant equipment gets starved for air whether through pressure drop, leaks in the line, too much equipment being run at the same time, miscellaneous use of compressed air and so on. Compressing air creates high humidity in the compressed air that turns into free flowing water in your compressed air tank and air lines. There are pages on this site linked from the Sitemap page that provide details on how compressors generate water, and what you can do about it, if that is of interest to you. New question about Compressor Sizing? If so, do add it here, and please upload some applicable photos if they will help others help you.